Has any electrical wizzard made one of these? It facinates me to learn that there are ways to do it yourself. I'd like to try my hand at making one. 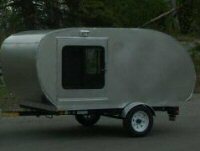 Yep...made mine out of a VW generator and a 2 horse Briggs engine. Mine works perfectly!!!!!! That is cool! Does it really take 3 1/2 horsepower to spin an alternator? Maybe they just use those because they are cheap and plentiful. I used a 3-horse vertical shaft lawn moor motor and a ford 1970’s generator with regulator. Got 30 amps out of it. The second was the same motor but used a jeep alternator and regulator got 30 amps out of it too. Then I took a GM alternator and took the windings apart and rewired it for 120v ac. Worked good for universal tools like skill saw and drills but the frequency was to high for anything with a transformer in it. Got 120v +/- 20v at 12 amps out of it. I think if I used a bigger motor it could have got a little more amp’s. I've built several. Since my house is solar PV powered I occationally need to charge the battery bank after several days of cloudy weather. My biggest one uses a 16.5 hp OHV Briggs lawn tractor engine coupled to a 125 amp alternator. The one I use more frequently is a 5 hp OHC Honda engine coupled to a 65 amp Ford alternator. I have large quiet mufflers on both. BTW I use a piece of nichrome wire from a dryer heating element as a field resistor. Ok You know the Forum plea... pictures please! I once made an air compressor out of an Air conditioner compressor out of an old Caddilac and an electric motor out of a washing machine. But I have the same question as EZ, do you realy need a 3 hp motor? I wonder if something as small as a Gas weed trimmer engine would work? How long does this have to run to recharge a battery? Hours? Days? But one question...? How do you shovel the snow out of that driveway of yours??? ha ha ha , (you have to be a true Minnesotant to appreciate a qustion like that) Keep up the good work. I have a good gas running weed eater that the shaft broke on. Could I build one of these? ...or any other ideas what I could do with the motor. I saw a blender for a boat that looked like a weed eater motor on the bottom. I was thinking about picking up a blender from a thrift store and seeing what I could do. Assuming the average alternator puts out 60 amps...that's equal to 720 watts (60 X 12 = 720) So then 720 is equal to .9648 HP (720 X .00134) Most weed eater motors should be about 2 HP or more. I have a gas helicopter motor that is .23 CC, a little smaller than the weedeater motors, and it is rated at 3 HP. So, in short, the weedeater motor would work fine, but maybe a little loud. The biggest problem with homemade generators is controlling the output. I used to have quite a bit of literature on the subject, but one thing which stuck in my mind was how often there were warnings about destroying the batteries by overcharging. If I can find a link, I'll share it. rampage wrote: I have a good gas running weed eater that the shaft broke on. Would that make it a "weed tease"......???? weed whacker motor will not "cut it" with an alternator for several reasons RPM being one and power being the other, for a small alternator the power required from Stall is just to great. Oops! Third time I've been wrong this year! For one of those small 2-stroke engines to work, they have to be running at full bore. I don't think people would appreciate a weed eater engine running at full throttle anywhere near their campsite.